Looking for a simple homemade light bright idea for the kids? Try making this one on the light table. It's a great way to work on fine motor skills too! 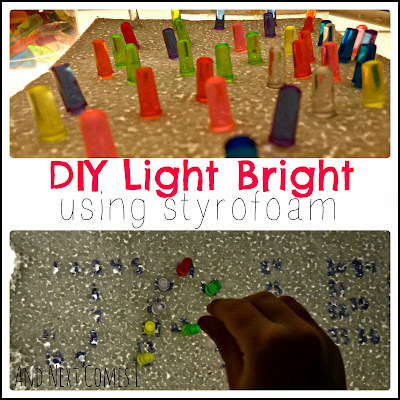 Light Table Activity for Kids: Make a Homemade Light Bright Using Styrofoam! I wish I could take credit for this idea, but I cannot. My husband came up with this idea when he noticed some perfectly reusable styrofoam in our garage. He figured that if it the styrofoam were thin enough, then it could make a great (and inexpensive) light bright. Especially if you already own some light bright pegs like we do. So off he went to make the styrofoam thinner for our experiment and once he was done that, I set up this simple invitation on the light table for J (K was napping - poor kid seems to miss out on a lot of fun). J started pressing light bright pegs into the styrofoam and, as you can see, it requires some precise fine motor work. He simply pressed the pegs in, creating nothing in particular. Once the pegs are fully pressed into the styrofoam, the light from the light table shines through, creating that instant light bright effect. I also thought the styrofoam looked pretty fantastic with the light shining through it. Meanwhile, my husband was brainstorming on how to tie some more learning into this activity. So on another piece of styrofoam, he wrote the letters of J's name, marking where each peg would go with a number. My awesome husband created this light bright sheet for him to practice letter formation and spelling his name (not that J needs help in that department! ), all while reinforcing his numbers up to 50. J really enjoyed this part, doing one letter at a time instead of completing his entire name. 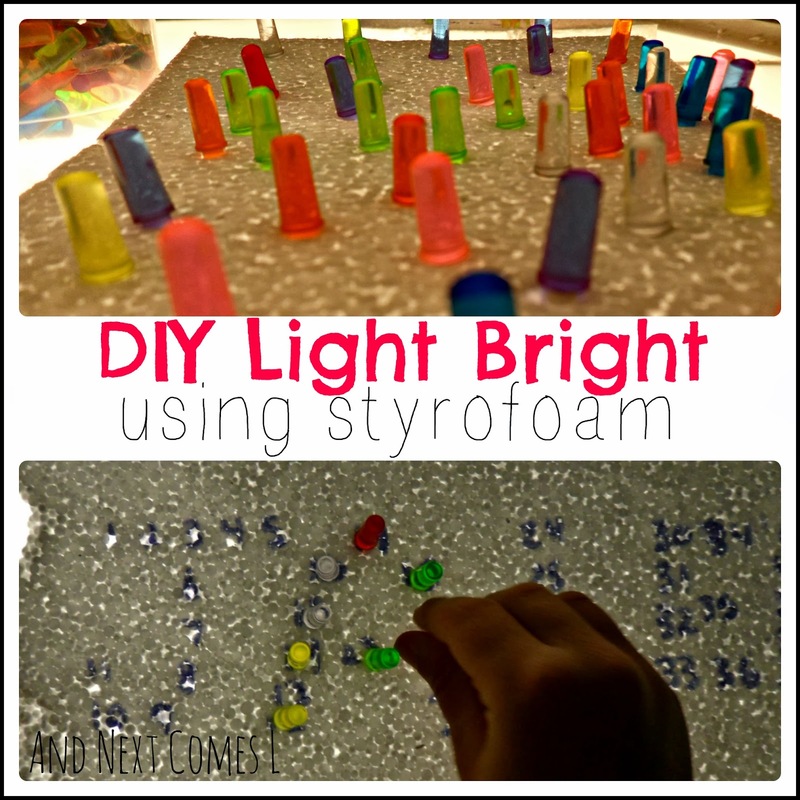 So if you happen to have some light bright pegs on hand, then give this activity a try! How awesome! Sometimes Daddies come up with some pretty cool ideas! We have my mom's old light bright! So fun! Daddies definitely do come up with some cool ideas. We had an old school light bright, but it started shorting out...so we just kept the pegs instead. That is awesome, tell Dad "well done!" I forgot about light brights, great idea to use them on the light box! Great job, dad! Ha! My hubby would totally come up with an awesome idea like this, too. : ) Oh how I remember playing with Light Bright when I was a youngin'!! So fun! This looks so cool! Yay Hubby!! I pinned it on my (CarlaINHouston) Sensory Activities board! My hubby rocks, what can I say! Thanks for pinning. Just wondering, the Styrofoam looks dark in the pictures? Is it white or did you paint it? Just unpacked a mirror for a client and it had great thin sheets of Styrofoam as packing material. Would love to do this with my Granddaughter. Wonderful idea! Great question. It is white. So it requires no extra prep. Enjoy!